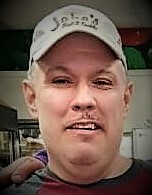 Mr. Christopher “Chris” Coulter, age 46, of Cusseta, AL passed away on Tuesday, August 21st, 2018 at the East Alabama Medical Center in Opelika, AL. He was born on December 24th, 1971 in Langdale, AL. Mr. Coulter is survived by his four children, Kelsey (Mike) Tyree, Theron (Kimberly) Coulter, Benjamin Coulter, and Noah Coulter; his parents, Ocie and Frances Coulter; his three brothers, Kevin (Heather) Coulter, David (Sandi) Coulter, and Jason Coulter; his sister, Alesha Coulter; his four step-children, Mikael, Austin, Amanda, and Megan; one grandchild, two nieces, one nephew, two great-nieces, four aunts and uncles, and several cousins. He was preceded in death by his nephew, Scott Coulter; his grandparents, an aunt, and two uncles. Mr. Coulter enjoyed traveling and working on helicopters. He had a great sense of humor and was very fond of sweet tea. He loved his children. Funeral services will be held on Saturday, August 25th, 2018 at 2:00 PM (EDT) at the Johnson Brown-Service Funeral Home Chapel in Valley, AL. Interment will follow in Johnson Memorial Gardens. The family will receive friends Saturday afternoon from 1:00 PM (EDT) until the service hour at the funeral home.